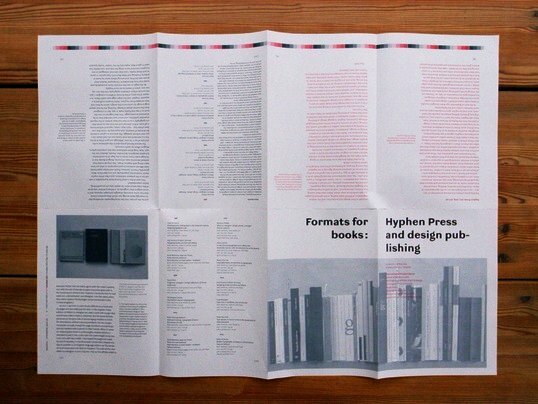 The uncut booklet that accompanies Hyphen Press’s ‘Formats for books’ exhibition in Birmingham asks for some fiddling, writes Jane Cheng. Much of the content is hidden inside folds or, when the booklet is flattened, upside down. 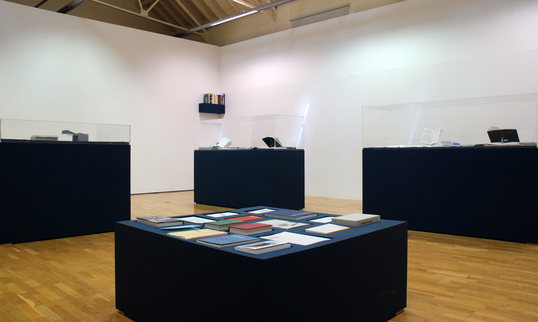 Since the exhibition concentrates on format, however, it seems more than appropriate: it demonstrates one of the principal rationales behind standard formats: standard paper sizes. The booklet can be unfolded to show how a signature is created from a single sheet of paper, in this case with very little waste. Page numbers and alternating colours can help the confused student fold the thing back together again; that failing, it doubles as a poster to hang on the wall. ‘I once met an academic,’ Hyphen’s Robin Kinross told us, ‘who said she never understood how books were made until she’d folded an uncut sheet.’ Nobody who has visited ‘Formats for books’ need say the same. 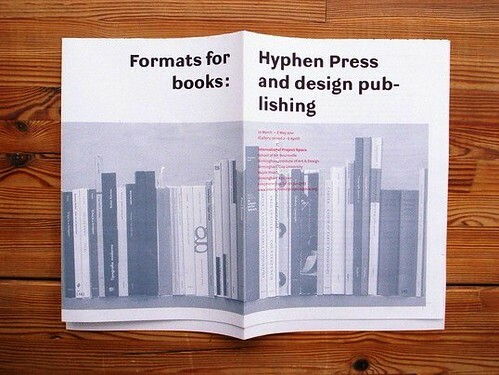 Included in the booklet are an essay by Robin Kinross on formats, another by Paul Stiff on the history of the press and a bibliography of Hyphen Press’s books. The booklet is free at the exhibition. Eye 75 (out now!) is a typography special issue, featuring illustrative type and lettering, calligraphy, type on the Web, a profile of Anthony Burrill and Mark Thomson’s Reputations interview with Fedra designer Peter Biľak, who has just set up the Indian Type Foundry (first release, Fedra Hindi). It’s available from all good design bookshops and at the online Eye shop, where you can order subscriptions, single issues and classic collections of themed back issues. Design MAs: is a year enough?